Memnosyne Institute cofounder Mary Ann Thompson-Frenk, center in red, celebrates with her husband Joshua Frenk and her mother at her side, along with friends and colleagues at the United Nations in New York City. Photos courtesy of the Memnosyne Institute. 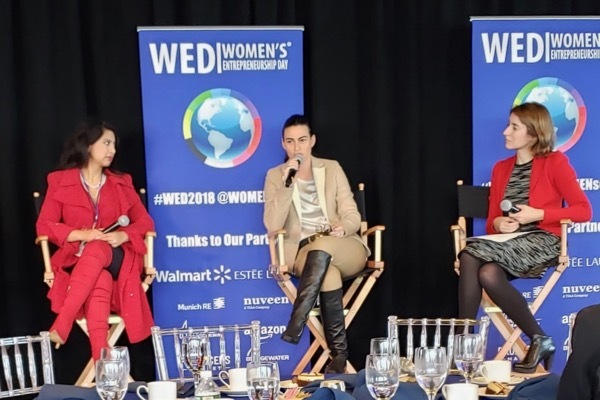 Mary Ann Thompson-Frenk, cofounder of the Memnosyne Institute, received the Women’s Entrepreneurship Day Civic Pioneer Award in a ceremony held Friday at the United Nations in New York City. The Memnosyne Institute is the parent nonprofit organization of this publication Green Source DFW; along with Food Source DFW, a charity food-sharing network; and many other local, national and international community building projects. The Institute is organized around seven centers - Interfaith Inquiry; Indigenous Cultures; Global and Social Outreach; Spirituality; Art; Health and Medicine; and the Environment, Science and Technology. According to Wendy Diamond, founder of Women’s Entrepreneurship Day Organization, Thompson-Frenk earned the award for her innovative work as a leader in global and cultural activism, contributions to social empowerment and a multitude of charity work. Mary Ann Thompson-Frenk, left, participated in a panel during the Women’s Entrepreneurship Day Summit.